Abby is the maker and pattern designer behind Cozy Moon Designs. When she’s not crocheting, you might catch her chasing her 3 young daughters, drinking iced coffee, and enjoying the outdoors. She lives with her family in Omaha, Nebraska. Keep up with her current projects by following her Instagram. Hello lovely people! I’m Abby, maker and designer behind the shop Cozy Moon Designs. A little about myself… I am a born and raised Nebraska girl, wife and mother of 3 little ladies and our pet guinea pig, Reeses. I started crocheting soon after my 1st was born 8 years ago and I’ve been designing patterns for close to a year. I also started knitting last fall which has been a journey in itself! There is something about creating something with your own two hands that’s so satisfying and little did I know, it would turn into this small business of mine. Crocheting is what I turn to when I’m feeling happy, sad, mad, anxious…it just helps me get through the day and I don’t know what life would be like without it. My passion is to create simple, modern pieces for all levels of makers, that I too love to wear!! I enjoy working with worsted weight neutrals the most with sprinkles of color here and there. The crochet pattern I am bringing to you today is very transitional piece that eases you right into fall! 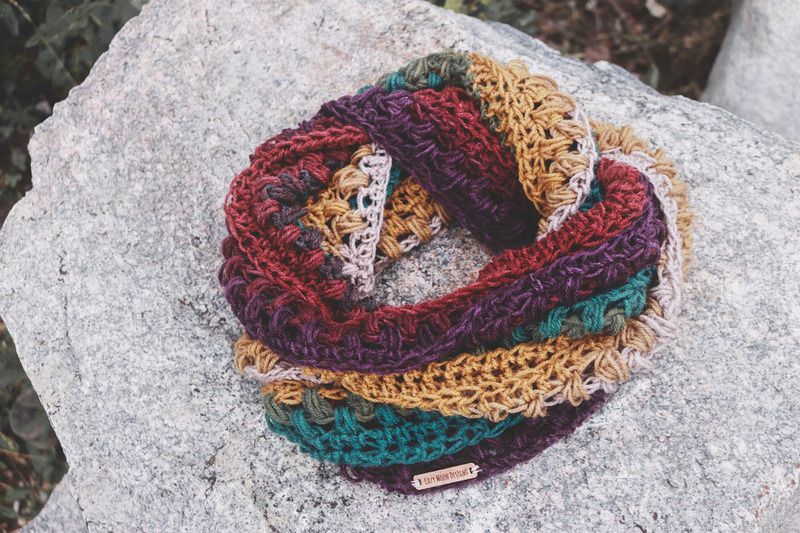 The light yarn and breathable stitches make it a perfect scarf for throwing over a tee or your favorite cardigan. This maker and fiber arts community has so much love and support…Jessica has always been a huge inspiration and I am so humbled to be featured on the Hook Nook Blog! Such a wonderful opportunity to be able to share this pattern with you all. 500 yds DK/Light Weight 3 yarn, I used one ball of Lion Brand’s Cupcake, Mandala or any similar weight 3 would work great too! With J-6.5 mm hook- 7 rows of 12 Hdc Blo st = 4x4” square. If your piece is smaller than this, go up in hook size. If your piece is larger than this, go down in hook size. **Ch2 at the beg of each round does not count as a st.
**Make sure your ch at the beginning of the pattern is a loose ch. You may choose to do a Fhdc in the beginning if you prefer that method, this will be your ch and R1. **Finished scarf should measure approx. 12” tall and 24” across. Make a very loose Ch 118, OR FHdc 118, join with a slst to beg ch, being careful to not twist ch. R7-16 - Ch2, Rep R2-6 two more times. R17-19 – Ch2, Then rep R2-4. Cut yarn and weave in ends.